Meru Cabs, India's No. 1 and preferred cab service today announced the launch of its world class cab services in Lucknow, Uttar Pradesh under the radio taxi license, strengthening its footprint in north India. Travelers in the state capital will now have access to Meru's reliable and affordable services through a click on the "Meru Cabs App' which provides cabs seamlessly. With a fleet of over 20,000 cabs on road, across 24 cities and serves over 5 million passengers Meru aims to expand its operations in Tier II and Tier III cities this year. As a popular tourist hub and a rapidly growing city, Lucknow is expected to benefit in infrastructure facilities and governance through the Smart City Mission. Backed by Meru's superior technology and professional service orientation, Meru will provide its services, under the Radio Taxi License with a brand new fleet of 50 cabs to start with, which will be scaled to 200 vehicles within the next quarter. 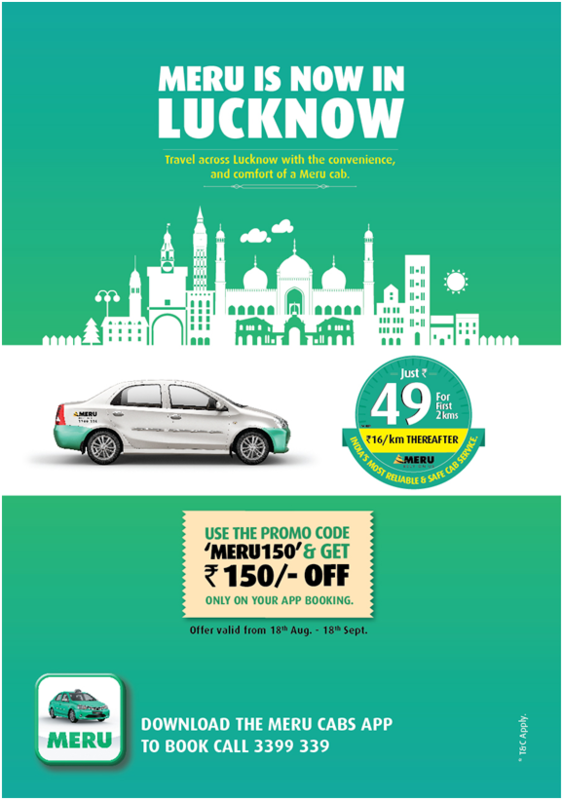 In the city of Lucknow, Meru Cabs services will be available for just Rs.49 for first 2 km & Rs.16 per Km thereafter. Passengers can book Meru Cabs by calling call center 3399339, on website merucabs.com or through its world class mobile app (Meru Cabs App) for Android, iOS, Windows & Blackberry phones. Commenting on the launch, Mr. Siddhartha Pahwa, CEO, Meru Cabs said, "With growing consumer appetite, higher disposable incomes and influence from metros, Tier-II and III markets provide vast potential to the transport industry. Travelers in these cities have shown more openness to the radio taxi service as they look for comfort, reliability and affordable travel options. Keeping these factors in mind, we are confident that we will deliver convenient and hassle free services to commuters in Lucknow and will also follow suit in other cities of the state in the near future." Meru Cabs's all new mobile app, with exciting new features includes one touch booking, tracking your cab, confirmed booking up to 7 days in advance and India's first Cab-Wallet. With this new development Meru Cabs is the first cab services provider in the world to partner with multiple wallets - Paytm, Mobikwik & Citrus. Given the customer centricity and wide array of features available, Meru Mobile App is currently India's top rated and one of the leading Cab App in the travel segment of almost every app platform - Android, iOS, Windows & Blackberry. Meru has introduced many pioneering features like "Trip Tracker' and "ICE' (In Case of Emergency), especially for the safety of women passengers. Meru also follows a stringent driver selection, recruitment and training process with its Meru Training Academy thereby ensuring all its drivers are well groomed, courteous and knowledgeable. Meru Cabs, a world class cab service was launched in Mumbai (April 2007) in association with India Value Fund, a premier India centric private equity fund. Meru Cab has pioneered the concept of GPS/GPRS enabled cab service in India. Since its launch, Meru has continued to receive an exceptional response from the customers and is consistently distinguishing itself as a provider of superior quality transport. Meru launched its MeruGenie services in December 2013, which is now present across 13 cities in India. In January 2015, Meru launched Meru Eve- a cab service exclusively for and by women. It's an initiative to bring to the lady passengers a safe and reliable way to travel. Now, Meru offers its world-class cab service across 24 cities in India under consumer proposition of Reliability, Safety & Transparency. Recognized by "The Limca Book of Records' as the largest fleet taxi operator in the country, Meru has completed more than 40 million trips across India. Meru has been voted as India's Most Favourite Cab Service by TripAdvisor Travellers' Choice for 2 consecutive years 2013 & 2014; and has won various other esteemed awards like, Times Travel Award 2011, IT User Award 2008, 2009 & 2010. Recently Meru also received the prestigious Economic Time's Most Promising Brands award for 2015.